Welcome to First Coast Fly Fishing Unlimited of Jacksonville – St. Augustine, Florida. Specializing in fly fishing and light spin tackle guided trips in the saltwater coastal wetlands of Northeast Florida. Capt. Rich Santos has been an avid saltwater fly fisherman and educator for over 25 years. His passion for this sport has driven him to create this website to offer you some unique services and share his knowledge and adventures, photos and video’s for your viewing pleasure. It’s also geared to help educate you with local fishing information, BLOG fly fishing reports, fly fishing articles, fishing and fly tying video’s, fly casting tips and instruction, Kayak fishing and more. You will find that it’s one of the most extensive and complete fly fishing websites in North Florida that will help you better understand and learn about fly fishing that no other North Florida guides website offers. Over the past 12 years Rich has fished and explored these Jacksonville-St.Augustine home waters with over 1,500 trips including well over 7,000 hours on the water plus 25 years overall fly fishng experience. This includes fishing 75 miles of the inshore saltwater tidal marshes and beachfronts from Amelia Island down to Palm Coast which includes Jacksonville, Ponte Vedra, Vilano Beach, St. Augustine, Crescent Beach, Matanzas areas and Palm Coast. Rich’s fishing style mostly uses Fly tackle with the option of light spin tackle. 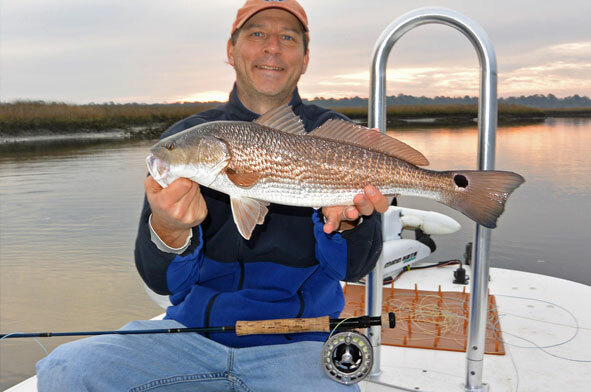 Specializes in sight fishing for Redfish around the low tide periods when conditions and time of day fished allows. We also do lots of blind casting around structure and holes when the water levels are higher. We generally will travel and cover several different areas to find fish and for you to see our natural beauty and wildlife. It’s mostly inshore fishing the saltwater tidal marshes which include a maze of creeks, shallow water flats and wildlife. There’s also high tide (summer-fall) flooded grass flats fishing for tailing Redfish, Sheepshead and black Drum around the new and full moon periods. Rich is a IFFF Certified Casting Instructor and enjoys sharing his complete fishing knowledge with you and specializes with helping beginners. If you are visiting the areas of Amelia Island, Talbot Islands, Jacksonville, Ponte Vedra, Vilano Beach, St. Augustine, Crescent Beach and Palm Coast, come see, learn, and join me for your back to nature and fly or light tackle fishing opportunities in northeast’s Florida’s pristine wilderness. Rich is FULL TIME guide with trips generally available on weekends, around holidays and most week days. Please call Rich in plenty of advance notice to book your specific day to fish as scheduled trips are general filled in about 3 weeks ahead. Thank you for your interest. Please feel free to call or contact me with any questions. Call to schedule your outdoor adventure today!